One of the most powerful things we can do for all kids is to treat them as fellow readers and writers. As writers, we all need help or advice at some time. Here are some websites and articles that might prove useful to your children/students. Sometimes just getting started can be tough. If that's the case with your young writers, suggest Scholastic's Story Starters to them. Spin four wheels to create prompts. Very young writers will have fun scribbling character notes about the character they create at Birmingham Grid for Learning's Characters. Free writing is useful for both young adult and child writers. One Word is a simple tool. It gives us one word then encourages us to write for 60 seconds using that word as a prompt. The Imagination Prompt Generator gives a scenario that can be used not just for writing, but also for an oral presentation or discussion e.g. "If I had 15 minutes to evacuate my home before it was to be destroyed by a hurricane, what 10 things would I grab (not including people or pets)." At The Story Starter Jr, click to generate a random sentence you can use as a story starter eg "The bully was crying in the backyard" or "The grandma was searching for a treasure map in the haunted house". These are suited to younger kids. Bill Zimmerman, of MakeBeliefsComix, has over 100 printable templates kids can use as prompts for their own writing. Bruce Van Patter leads kids to writing with scaffolding and prompts on his website. Kids can choose a face and answer questions about it to develop a character in Mugshots, choose hero, villain and setting to get a story starter in Story Kitchen, and get curious headlines like 'CIRCUS NEIGHBOR COMMANDS TREE' in Weird Headline Maker. Another great resource from Scholastic is their Writing with Writers. Kids take workshops with authors, editors and illustrators to develop skills in news writing, myth writing, descriptive writing and writing book reviews. Kenn Nesbitt offers help for kids who want to write poetry at Poetry4Kids. Pie Corbett's blog has some wonderful creative inspiration for poets and writers of all ages. At DeeScribe Writing you'll find great advice from Australian author, Dee White, for writers of all ages. Dee has also written 10 Top Writing Tips, a free guide for young writers who want to be published. At children's book author, Lynn Plourde's blog you'll find lots of advice, in text and video, to make writing visible for young writers. Check out articles like Writing Funny and Writing Titles. 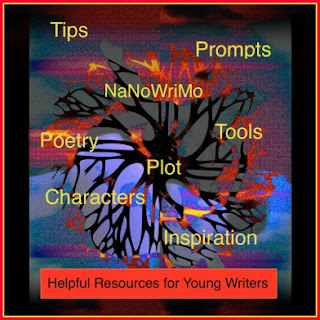 The NANOWRIMO Young Writer's Program has three excellent workbooks available for elementary, middle and high school kids. If you know a young adult or older teen who loves to write, suggest StoryToolz to them. There they'll find a Story Idea Generator, Random Conflicts and a Half Title Generator. These tools might provide teens with ideas for when they're suffering from writer's block, or just want to fool around with ideas for a story. There is also a cliche buster where users can paste text in and the software will recognise and point out cliches. StoryToolz is not really appropriate for primary aged kids. Conflicts include themes like metamorphosis and Murderous Adultery, nothing teens won't find while reading Kafka or Shakespeare, but probably not something we want primary kids to consider. Tomorrow is the start of Children's Book Week in Australia! Have a wonderful bookish week!